Hi everyone. Sorry about missing our Tuesday Tips post today. So, here's the thing - I still want to continue the "How To Start A Reselling Business" series, but we're going to have to take a little hiatus from it. I hope you'll all stick around on the blog until we can start it up again. But for the near term - we've realized that it's just too much work / time committment with too little return on that investment. I was hoping to get around 300-500 readers on the series, but it's more like about 50-60 as far as I can tell. I just can't justify spending that much time on it. So we'll keep going, but the series will be released gradually, probably over the next 6 months. For those who need the information sooner, sorry about this! On a brighter note - we've been picking up some really nice things at the thrift lately. 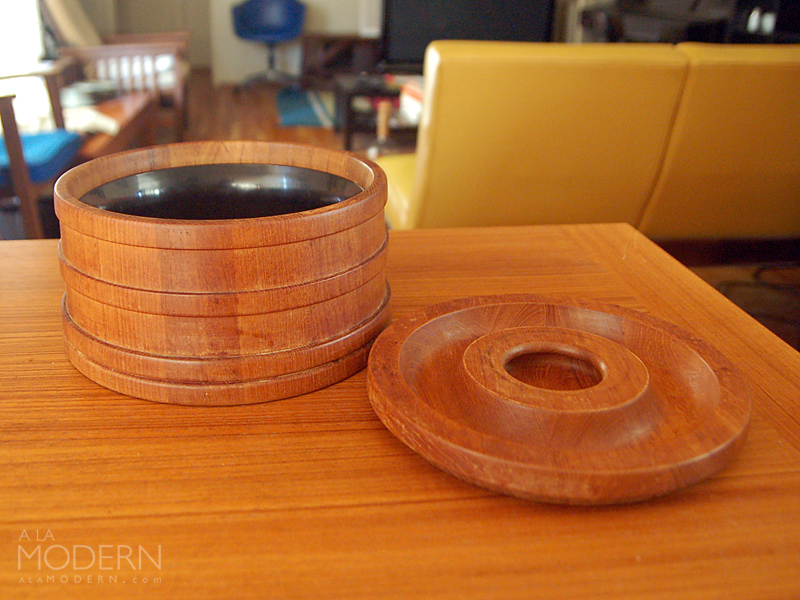 The latest from this weekend was this short Dansk teak ice bucket designed by Jens Quistgaard. We've gotten very lucky with Quistgaard teak items in the past, but it's always a happy day when we come across more of them. Look for this one to make an appearance in our Etsy store in a few days.